Last week, we saw the Duchess of Cambridge wear her diamond wedding earrings in public for the first time since the royal wedding (which, believe it or not, was more than five years ago!). Here's a closer look at these special earrings. 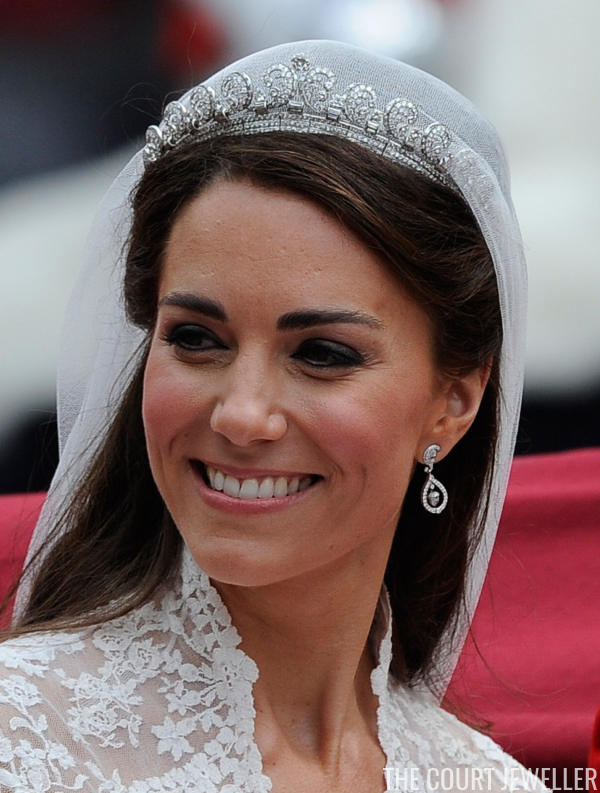 The earrings were custom-made for Kate's wedding ensemble by Robinson Pelham; they were a gift from her parents, Michael and Carole Middleton. (Carole wore another pair of Robinson Pelham earrings, the "Pagoda" girandoles, during the wedding celebrations.) 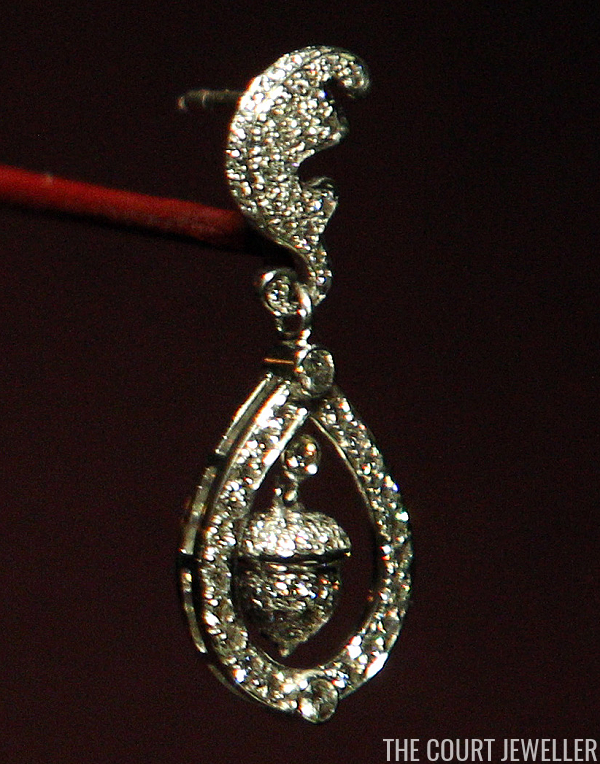 Connections to the Middleton family are visible throughout the earrings. Per an official royal wedding press release, the earrings are "diamond-set stylized oak leaves with a pear shaped diamond set drop and a pave set diamond acorn suspended in the center." 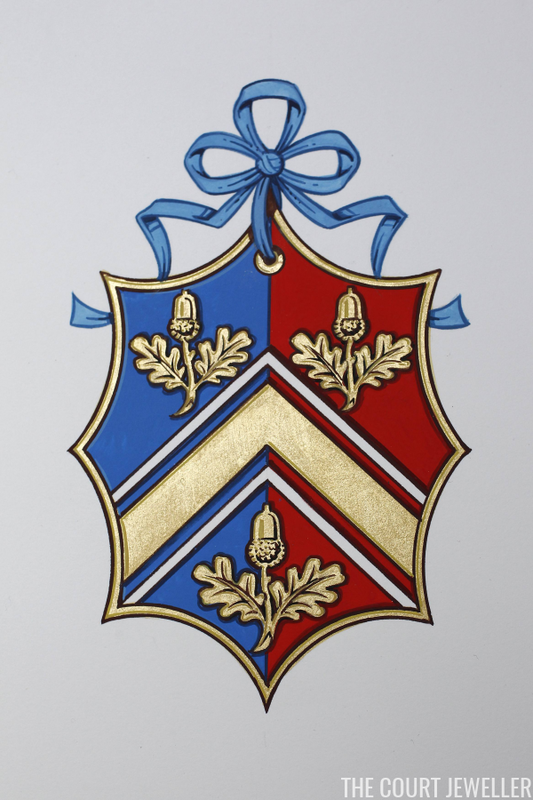 Here's the Middleton family's coat of arms, which was granted to them shortly before the royal wedding. The family was reportedly very involved in the design, which (like the wedding earrings) features both acorns and oak leaves. Here's a discussion of the oak/acorn symbolism from the Cambridges' official website: "The three acorns represent Mr. and Mrs. Middleton’s three children (The Duchess of Cambridge, Philippa Middleton and James Middleton). Acorns were chosen because the area in which the children were brought up West Berkshire, England is surrounded by oak trees. Additionally, oak is a long-established symbol of both ‘England’ and ‘Strength.’" The earrings that the Middletons gave Kate were designed to echo these same symbols. The earrings, though, were also made to mimic the design of an heirloom royal jewel. 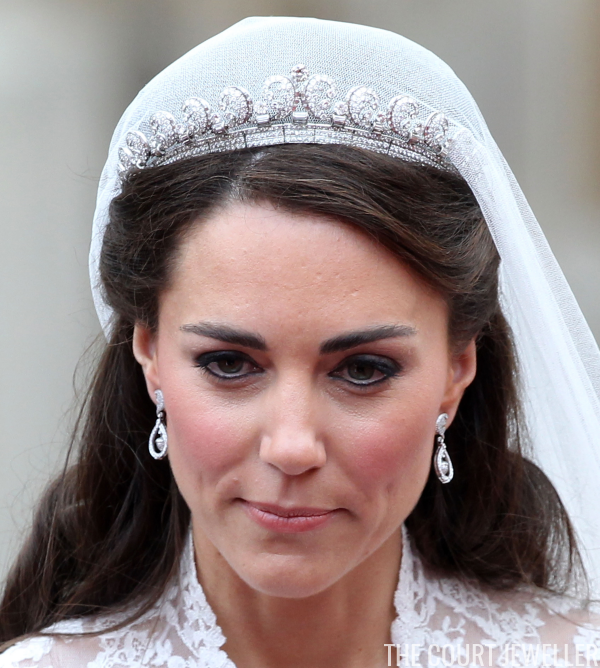 The "diamond-set stylized oak leaves" of the earrings reflect the curling diamond scrolls in the Cartier Halo Tiara, which Kate also wore on her wedding day. See how the direction of the diamond scrolls in the tiara and the diamond "oak leaf" studs of the earrings match? After wearing these on her wedding day, Kate didn't appear in them again in public until Garter Day 2016. On that particular occasion, she paired them with her Mappin and Webb Empress Mini pendant necklace and the bracelet from the diamond cluster and baguette suite. 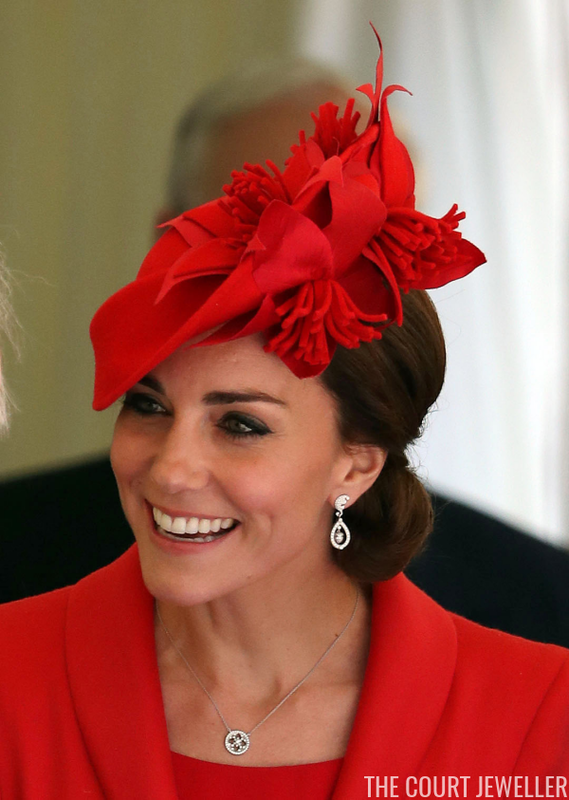 I'm a little surprised it took so long for Kate to get these out again; they're personal and sentimental, and their all-diamond setting makes it easy to coordinate them with other pieces.